There are two industrial solutions for processing asbestos waste in Europe: landfill or vitrification, as offered by Inertam. 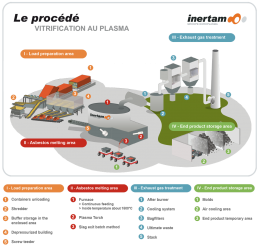 The plasma torch vitrification process is currently the only alternative to the storage of asbestos waste in landfill. By bringing the waste to its fusion point at a very high temperature, Inertam melts the asbestos fibres, and thus removes their toxicity. 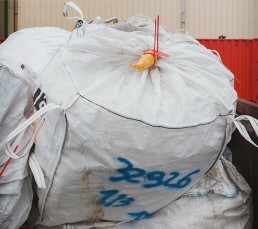 The containers of asbestos waste are placed on an automated container carrier that can enter contaminated areas. The carrier passes through a three-door airlock fitted with a washing and decontamination station. The waste is then tipped onto the feed conveyor for the grinder, and the ground waste is then directed towards four storage containers according to the type of waste (silica, calcium, combustible, gypsum). The loading conveyor for the furnace is simultaneously fed by the four ground waste storage containers. The controllers regulate the proportions of the four types of waste, as well as the requirements of the furnaces, making it possible to achieve a fine, even mixture, and thus ensure good waste fusibility. The asbestos waste is continuously added to the fusion chamber, where two 2 MW torches are used to bring it up to a fusion temperature of between 1,400° C and 1,600° C. The asbestos fibres are totally destroyed. The molten material is then progressively drawn off from the refining chamber (smelting furnace) where a third 700 kW torch is used. The molten vitrified product (called Cofalit) flows in this refining zone. The torch here is less powerful than the two others, and it maintains the temperature of the Cofalit while repelling any non-molten or floating elements towards the fusion zone, away from the casting zone. The gases released in the furnace are extracted and sent to the gas processing system. The gases released in the furnace are extracted and sent to the gas processing system. The molten bath is cast into a mould, which is placed in a storage area to cool in the open air. 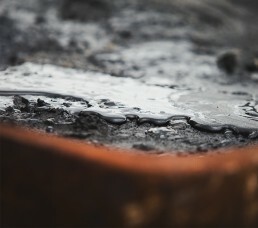 The mould is then turned out and the Cofalit is stored on a storage platform before being crushed, with a view to being reused as a road-building substrate. Cofalit, a material obtained from the fusion of asbestos waste, is inert and reusable. 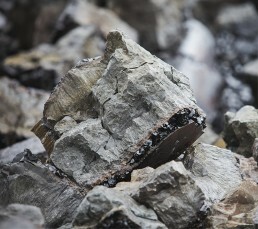 This material is mainly reused as aggregate, to form a road-building substrate. Other uses are being examined, particularly for the storage of solar energy.